Heat oven to 400°F. Cut 6 rounds from puff pastry with 3-inch round cutter. Place on ungreased cookie sheet. Bake 12 to 15 minutes or until puffed and golden brown. Keep warm. While pastry is baking, in 4 1/2- to 5-quart Dutch oven, melt butter over medium-high heat. Add potatoes, celery, carrot and onion; cook 5 to 6 minutes, stirring frequently, until onion is softened. Beat broth, flour, poultry seasoning, salt and pepper into potato mixture with wire whisk. Heat to boiling; reduce heat to medium-low. 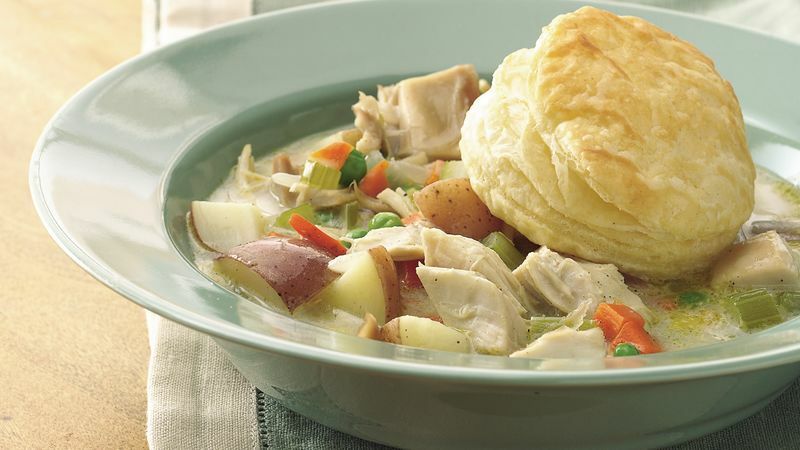 Cover; cook 15 to 20 minutes, stirring occasionally, until potatoes are tender and soup is slightly thickened. Stir remaining ingredients into soup. Cover; cook 5 to 6 minutes, stirring occasionally, until chicken and peas are hot. Ladle soup into bowls; top each serving with pastry. Look for puff pastry in the freezer section of the supermarket with the frozen pie shells. What do you do with the leftover cut pastry pieces? Sprinkle them with some cinnamon and sugar, and bake for a special snack-time treat. Wondering what to serve with this soup? A fresh green salad with sliced tomatoes and roasted garlic dressing is the perfect answer to this puzzling question. An easy way to add layers of flavor is to use poultry seasoning. A blend of sage, thyme, marjoram, rosemary, black pepper and nutmeg, this seasoning lends a subtle savory note to chicken and turkey dishes.